A coastal cottage by the sea in Palmetto Dunes. Put your bare feet up and enjoy relaxing lagoon views from this 3rd-row ocean home on the **brand new deck and outdoor living space with private *heated pool. [**pics coming soon of the renovations that include a new circular drive, new front, and back porches, and additional outdoor covered living space to enjoy by the pool]. Just off the main living area is a large deck overlooking the pool and the lagoon. There are 2 wings with each having one king master suite with oversized private bathrooms. 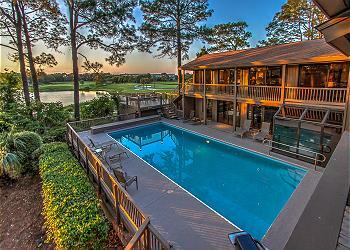 This Palmetto Dunes dream home has everything you need for an amazing family vacation!